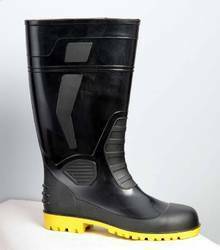 Manufacturer of a wide range of products which include safety gumboots, steve gumboots, black acme cosmos ultra pvc safety shoes, pvc gum boot, steel toe pvc gumboots and button ankle boot. The utility design is reinforced at the heel ankle and is durable as well as flexible. They have full comfort insole and offer great comfort for even long work shifts. We have uniquely positioned ourselves as a reputed name in the market offering world class quality array of Steve Gumboots. These shoes are made from quality range of rubber and leather. They are specially designed to ensure safety. Furthermore, it is tested against many quality parameters to keep it as per set quality standards. Without compromising with the quality, our offered range of PVC Shoes is designed in accordance with market quality standards and norms. Highly appreciated in the market due to its perfect finish and tough soul, these products are available in various sizes and specifications to suit as per the varied needs and choices of our customers. Button Ankle Boot With Steel-Toe Cap Made From Fully Automatic Machine Imported Moulds. We are actively engaged in manufacturing and supplying an extensive range of Safety Gumboots. All these products are designed keeping in the specific choice of the customers. 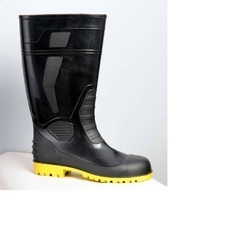 Available with us acid alkali Gumboots, we also customize these products as per the demands of the clients. Additionally, the offered array is tested against many quality parameters to keep it as per industry standards. Moreover, the whole array is available in nominal rates.